This chest started life as a Bombay Company purchase about 15 years ago. 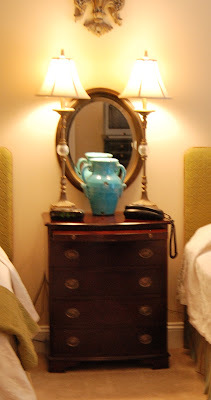 It has worked in many different spaces in several different houses, but it's been the nightstand in my guest room for awhile now. I've always liked it, and it's very sturdy, but it was beginning to look a little worn. A perfect candidate for painting! 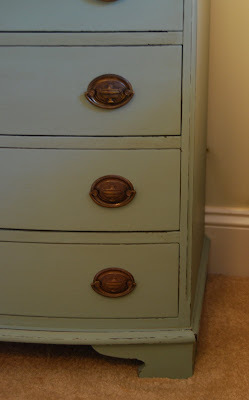 Chalk paint is a great alternative if you want an Old World kind of look for your piece. One of its greatest advantage, as far as I can tell, is that you don't have to prep a piece before you paint it with chalk paint. You just remove any hardware from your piece of furniture, dip your brush in the paint, and go for it! You can buy ready-made chalk paint, and I've heard great things about Annie Sloan's Chalk Paint. I have not tried ASCP. Inspired by Sherry of No Minimalist Here, I made my own chalky paint mix. I simply mixed regular latex paint with a chalk product (I used plaster of Paris because that's what was readily available). I had good results mixing 4 ounces of paint with 2 ounces of plaster. I measured the paint in a liquid measuring cup and measured the plaster with a solid measuring cup (2 ounces = 1/4 cup). I stirred the mixture together really well and, if it ever felt a little too thick, I thinned it with a bit of water. I wanted a very specific color (Benjamin Moore's Sutton Blue). I didn't want to spend much money. Now for the beauty of this paint. It takes distressing really well (the chalky paint scratches off very easily). After distressing this piece with sandpaper, I used some wipe-on stain to add depth of color, then finished it off with paste wax. I think you can purchase specialty waxes, but I just used Johnson's paste wax from the hardware store. As you can see, this technique allows you to achieve a custom finish that looks aged and time-worn. If you're not going for an aged, time-worn look, this method probably isn't for you. Will I be using this kind of paint on anything else? To be honest, I don't know. In most ways, I think I'd rather have the ultra-smooth finish of regular latex paint. By contrast, people who try Annie Sloan Chalk Paint usually become devotees! So far, my favorite method for painting furniture is still spray paint, but of course the spray paint color palette is limited. All in all, I'm happy with my foray into the world of homemade "chalk" painting. Important note: After I wrote this post, I learned that the term "CHALK PAINT" is actually a registered trademark of Annie Sloan. What I did was to create a matte latex paint product and achieved what I believe to be a lovely finish, although I did not make real "chalk paint." I'm certain that Annie Sloan Chalk Paint must be a wonderful product, and I've learned that it is indeed very durable. Perhaps some time in the future I'll give the real ASCP a try. If I do, I'll be glad to pass along my opinion of its performance; it would be fun to compare it with my homemade chalky mixture. What do you think? Have you used chalk paint of any kind? Thanks so much for this great tip. I almost bought the expensive Annie Sloan paint and wax ... just last week. WOW!!! It is gorgeous!!! Yes, I haven't tried the chalk paint because of the cost. Thanks for a great alternative! Oh, wow! 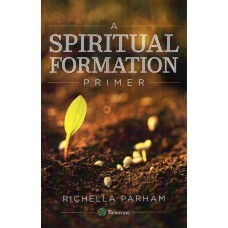 It looks amazing, Richella. :) Love the distressed edges! This turned out beautiful....and thanks for the recipe!!! I think I'll give it a try!!! 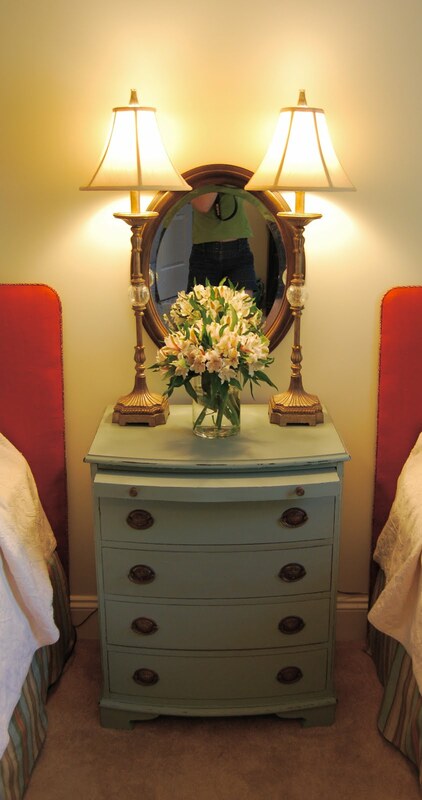 I have never heard of chalk paint...but your piece sure looks nice Richella! I think you did a great job. I can't wait for the next part of the reveal! Richella- I think it turned out great. LOVE the color. I am not a 100% chalk paint enthusiast either. I do like it but you are limited in how "fine" of a finish you want. I like it for an aged look though. I think it is probably going to run its course over time...as everything else seems to do. I have a few pieces painted with it but don't know how many more I will do. Wow! This is adorable! I love your technique and am so happy to know how to do this now. Thanks, Richella! 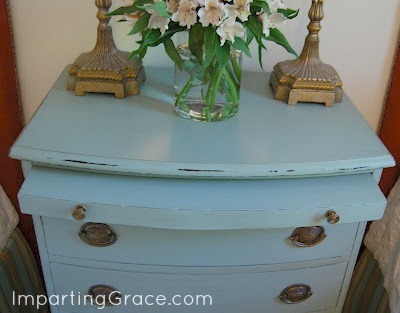 I haven't chalk painted yet, but I LOVE that dresser and now I want to try your method! It looks so good with those colors I see peeking through. Can't wait to see it all! Your piece is lovely, congrats on a job well done. I can't help but want to correct a few of the commenters on a few important Annie Sloan Chalk Paint™ facts. first I must tell you that Yes, I am a Chalk Paint™ retailer, but I was using Annie's paint for quite a while before I started selling them and conducting workshops (I taught at Annie's American Tour stop in Boston). As for the paint running it's course...Annie Sloan Chalk Paint™ has been around for more than 20 years...well tested and with an excellent reputation. Mixing anything into Latex paint does not make Chalk Paint™... it makes a matte textured latex paint. Not the same thing at all. The term Chalk Paint™ is trademarked to Annie Sloan Unfolded and as such protected. Annie coined that phrase over 20 years ago. At an Annie Sloan Workshop you will be shown how to achieve a finish we call a 'Modern' finish...smooth as glass. The outside of Annie's Oxford, England storefront is painted with Chalk Paint™..so yes it is very durable. I can send you a link to a store in Florida, who painted their outside driveway two years ago and it still looks great. Concerns about price...Shaunna of Perfectly Imperfect did a great post about why she loves Annie's paint and you can also check out this post.. Ok...I will get off my Chalk Paint™ bandwagon for now. Again..very happy your dresser turned out as you had hoped. 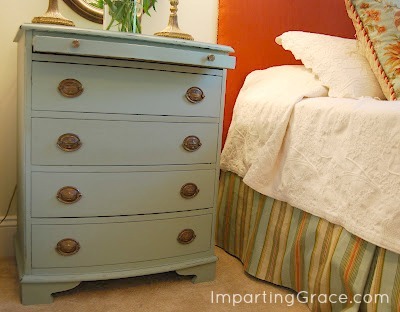 Chalk paint or not, I love the dresser! It looks professional even. I'm super duper impressed and I love what it does to the room. Janet, thank you so much for all that wonderful information on ASCP! I had no idea that the term "chalk paint" was a trademark, and I'm sure others were in the same boat. It's good to know that the real chalk paint is indeed very durable. It is an expensive product, but I certainly don't mind paying a little more for a very good product. I must be seriously out of touch with the "trends" because I've never seen this but I LOVE it! This is my favorite look for painting furniture. Maybe I can try it out on some of my projects for this summer. Beautiful. It looks great. I love the color you chose. Thanks for sharing your homemade version and your experience with it. I'm gonna have to try it now. great restyle :) love the color, I have mixed my own paint with plaster of paris and the results were great. I also love ASCP but I can't buy every color so I improvise, thanks for sharing. Stop by for a blog visit. Apparently, someone representing Annie Sloan is giving the impression that they have a trademark on the words, "Chalk Paint". Not true. A.S. has trademarked her logo with Chalk Paint in all capital letters. Her chalk paint logo has a distinctive chalky looking font. She does not have exclusive rights to those words, even though people are being contacted all over with the implication no one else can use the words chalk paint. Oh yes they can! You can Google trademarks and look up her trademark description. You can also go to the US Gov trademark site to see more information, though the search is much trickier. Description of Mark - The mark consists of stylized terms "CHALK PAINT" in all capital letters. Love the dresser you did! I have used a lot of ASCP and have also made my own chalky paint and I love both. Shaunna at Perfectly Imperfect days that ASCP goes such a long way on furniture pieces that it doesn't end up being all that expensive... I both agree and disagree, depending on the color. ASCP Old White (and any white paint going over wood) takes at least 3 coats to absolutely cover the wood. But other colors in ASCP cover in one coat, like her Duck Egg Blue (which I LOVE). As for distressing, ASCP and the homemade version both distress wonderfully. BUT, you don't have to distress your newly painted piece at all! You also don't have to use wax as your top coat! I'm all over the Internet reading about ASCP and homemade chalky paint and rarely do I read about someone using a top coat other than wax with these paints! A wax finish is beautiful, but if I'm painting a piece of furniture for myself or someone else that will get some abuse (coffee tables, kids dressers, kitchen tables or chairs), I don't use wax. I have put both polycrylic and varathane (which is dries diamond hard and is my fav for furniture) over both ASCP and homemade chalky paint with excellent results! So, to get a glassy finish with chalk paint, don't distress and get a high gloss poly top coat. By the time you're done, you won't be able to tell if it's straight latex or a chalky mixture. And with no prep work. It's the best of both worlds! Richella, the chest is beautiful! Thank you for sharing your recipe. Janet, I have only used Annie Sloan, and it is absolutely worth the money. The colors are all gorgeous and somehow seem to match! I've painted two sets of bathroom cabinets, two living room chairs, a foyer table, the dining room chairs and table. And the most amazing thing is I am NOT skilled in this area, don't have a lot of time, and have never done anything like this. Now I can't wait to get finished with one and start a new one. All my "early married" furniture is fun and new again!